Drive-in movie theaters are pretty much a thing of the past, with barely any around still surviving. But that doesn't mean they can't be re-envisioned into something new and exciting for movie fans nowadays. 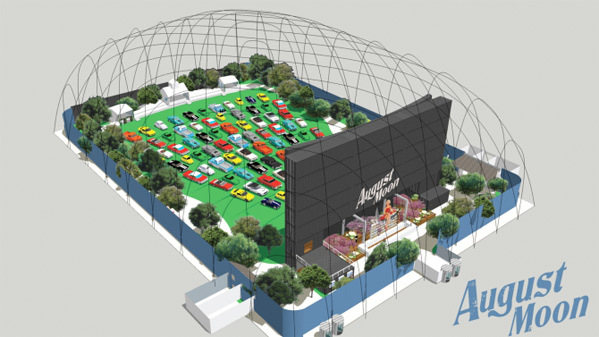 A new movie theater concept is being built right now in Nashville, Tennessee called the August Moon Drive-In, as reported by Variety. The cinema is situated in a "40,000-square-foot, air-supported dome, complete with simulated starry sky" and features seats in modified classic cars along with food service and a full bar. Best of all, the screen they're using will supposedly be "the largest non-IMAX movie screen in North America". The August Moon Drive-In is being developed by Michael Counts, a director of "sprawling, immersive theater events in Brooklyn" before moving on to more immersive live events. "Essentially we’re building a soundstage,' he said of what's envisioned as an intricately detailed recreation of an outdoor space with grass, trees, hammocks, fireflies, sunsets and the scent of meadow air. 'We're building a set as if you’re going to shoot an outdoor scene in a movie, on an indoor stage.'" As fun as that sounds, it sounds so fake and so fabricated, that it might be hard to appreciate because it seems more like a kitschy Disneyland attraction than an actual movie theater above all. But we should still hope for the best when this opens in late 2018. In addition to the movie itself, the August Moon Drive-In includes pre- and post-show interactive events. "The entire experience of seeing a movie — including exploration of the space plus food and drink service — is estimated to take about three hours for a 90-minute film, with around 350 guests accommodated at each of the projected 18 screenings per week." They'll be showing new releases and classic movies, and the price for the ticket will range between $8 to $20, "depending on the location of the seating, with food and drink to be charged on top of that." I'm certainly curious about this place, here's to hoping it's actually a good idea. Interesting idea, but I'd rather see new, updated versions of the classic drive-in. You can't simulate that experience. As kid we'd go to one with a huge piss trough that creeped me out. I hate those troughs. Glad they're not really a thing anymore. Disgusting. Cool, but outdated. Here in Sacramento, we have a legit one that has been around for decades...The people who go are pretty annoying so I stopped going a while back. It's definitely not an experience to frequent, but it's fun every now and then. It's much more of a hassle than just going to a theater. I'm 30 minutes from Nashville so this is a win for me. I'm in Nashville and I'm pumped for this! Our drive-in outside of Portland was just granted a new projector a few years ago. Fun to go out there a couple times a summer since it's 2 movies for the price of one. No simulation needed. We have open air cinema here, but no-one takes their cars, it's just in a nice park. I know the distance people have to travel in the US usually requires a car so it still makes sense to have these.